The hostel was a little hard to find (a bigger sign might be helpful...) but when I finally arrived I was made to feel very welcome from the moment I checked in. Different lounge areas are a great opportunity to sit and meet other guests or the very friendly and helpful staff. During my stay, Alex provided fun nights out and Laken offered exciting day trips and rides for very reasonable prices. The house itself is a beautiful building with many lovely details like a library full of funny and interesting books, humorous signs, good games and a great porch/ back yard. Oh and a hostel cat (not allowed in the house, for those worried about that...). I had been traveling for a few weeks before my stay here, but this hostel was definitely the highlight of my whole trip. Thanks for that and keep going! P.S. The science fiction theme is a bit funny and only partly realised - maybe focus on the history of the beautiful building, on the social character of the staff...? Such a great hostel. Super clean, rooms are nice and spacious, kitchen facilities are perfect. We had a really great time here. It’s got a great atmosphere, very chilled and relaxing. The staff are fantastic. Each and everyone of them were so lovely and helpful they really made the stay. THANKS! I had a great stay at Site 61!The staff was great. Everyone was nice and knowable. The rooms are clean and I felt safe. The beds are sturdy.Even if you are on the top bunk, the step ladders are easy to negotiate in the middle of night. Few blocks away from canal cable car line and close to the E2 airport bus. Booked durning the 4th of July so hotels were twice the price per night. Found this little place and a private room for less than 80 bucks a night. Secure entrance, with extremely helpful staff. The upstairs and individual rooms are also secured with video surveillance. They had an extremely delicious bbq for guests (no extra charge) and offered travel advice with friendly conversation. Facilities are clean, not crowded, simple offerings, and fresh sheets. Uber/lyft can pull right on up, but don't walk around at night. Great and clean hostel; friendly, helpful and flexible staff; nearby public transport to French Quarter as well as a bus station for a bus to the airport. There are also parking spots in front of the hostel. It is located on a busy and noisy street but inside I barely noticed it, so don’t be deceived by a first impression. The rooms are cozy and the beds were comfortable and I had a good night sleep! There are 6 bathrooms which are clean and separate so they felt more like private bathrooms. The breakfast was simple but good with bagels, orange juice & coffee and they provide a kitchen area with fridge to store and make your own breakfast. It is a cheap and nice way to stay in New Orleans, I‘m glad we found the hostel! The hostel is one of the best of the hostels I have ever stayed in. Very nice kitchen and garden, rooms and bathrooms are clean and nice. There is a free breakfast that includes bagels, cereals, coffee and orange juice. 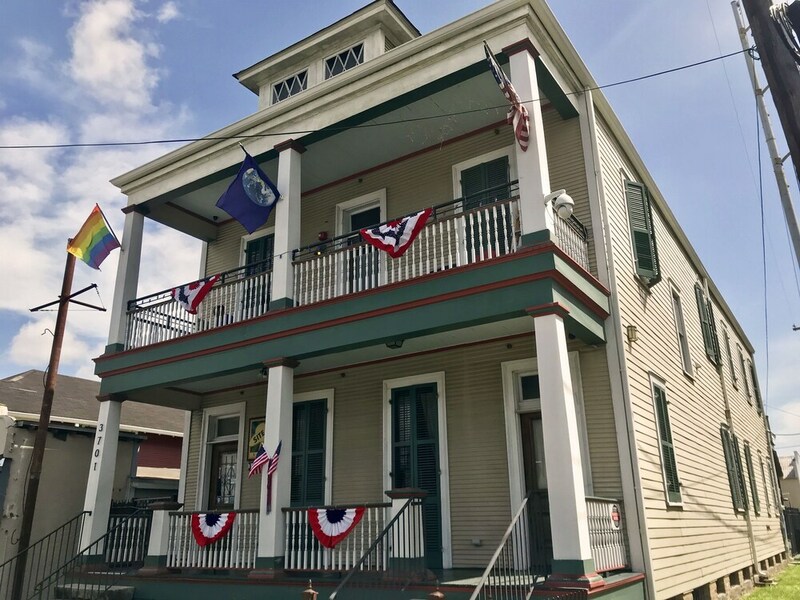 Located in Mid-City, Site 61 Hostel New Orleans is within 2 miles (3 km) of popular attractions such as Canal Street and New Orleans Museum of Art. This 9-room hostel welcomes guests with free breakfast and conveniences like free in-room WiFi and free self parking. Guests can expect to find free WiFi. Other standard amenities include a dining area, a refrigerator, and a microwave. Bathrooms are shared. Site 61 Hostel New Orleans features free WiFi in public areas, coffee in a common area, and microwave in a common area. If you drive, take advantage of free parking. Helpful staff can provide tour or ticket assistance, luggage storage, and access to locker space. Additional amenities include a refrigerator in a common area, a library, and laundry facilities. The preferred airport is New Orleans, LA (MSY-Louis Armstrong New Orleans Intl. ): 17-min drive, 12.6 mi/20.3 km.